Live, breathe, drink. 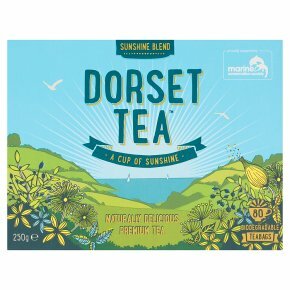 Great taste 2017.Tea that tastes as good as the sunshine makes you feel Like you, we love the sunshine and in Dorset we are extra lucky, enjoying 364 more hours of sunshine throughout the year compared to the UK average. We think our tea tastes as good as the sunshine makes you feel, that's why we call it Sunshine Blend so go ahead and pour yourself a cup of sunshine! Our delicious tea is a blend of the best quality Kenyan tea, grown in the rich volcanic soil of the Rift Valley, mixed with the brightest and most flavoursome Rwandan leaves. We've also added a touch of malty Assam which gives our Sunshine Blend an extra depth of flavour. A truly golden cup of sunshine to be enjoyed all day, every day. Dorset Tea's Guide to Brewing the Best Cup of Tea Just follow these 3 simple steps for the perfect Dorset brew 1: Place one bag per person in your favourite cup, mug or teapot. 2: Infuse with freshly boiled water for 3-5 minutes. 3: Add milk and sugar to taste. You now have the perfect cup of Dorset Tea?... Relax & Enjoy!